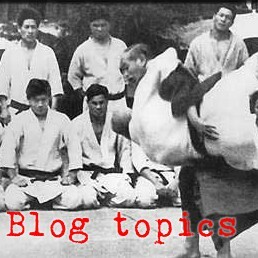 Links to previous articles on The Walk - nanameashi, wakiashi, tenkanashi, shomen tegatana, soto mawashi, uchi mawashi, uchi-soto gaeshi, uchi mawashi gaeshi, and soto mawashi gaeshi. The next motion in this set of exercises is koshi kaeshi - the hip switch. Of all the motions in the exercise, this is probably the most universally applicable. Hip switch is absolutely everywhere in aikido and judo. I don't think it is possible to do any technique or action without using koshi kaeshi to adjust the direction or facing of your hips. 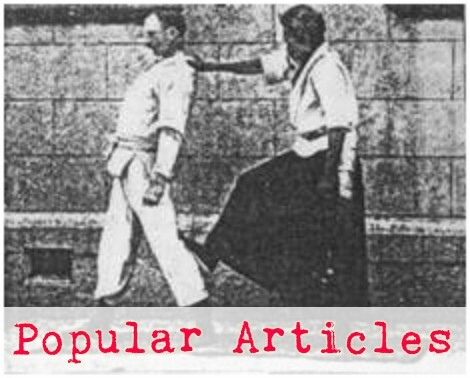 In virtually all of Tomiki aikido, techniques are performed from shizentai (natural posture) instead of Ueshiba's hanmi (half-facing stance). From shizentai it is not possible to hip switch more than about 135 degrees and still end up in shizentai. As you switch farther, you start to get into hanmi. If you start in hanmi, though, you can hip switch 180 degrees and end up back in hanmi. This is not "doing the twist" or "stomping roaches." The weight does not stay even between the feet and heels twist to face a different direction - this is weak and endangers the knees and is difficult to do with grippy shoes. The feet move at different times, with the front foot turning, the weight shifting to that foot, then the hip and the other foot switching. The weight shifts slightly to the new back foot leaving you in a shallow hanmi or back stance. The kata form of this hip switch is sort of generic. When it shows up in specific techniques, like shihonage, it looks different. It is good to practice the hip switch in different configurations, like Adrian and Eddy do in the first few segments of the above video. And this applies to all of the exercises - it's good to tear this kata apart into individual chunks and practice each chunk in different configurations with different emphases or exaggerations.